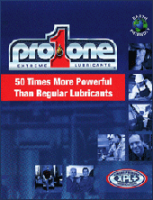 ProOne Lubricants offers Rust Pro™ Rust Inhibitor capable of providing up to 5 years protection in indoor storage and 2-3 years protection outdoors. For carbon steel or any exposed metal or painted surface in high-salt environments. Proven and used by major oil & gas companies for their stack-out programs and pipe protection. Rust Pro is an oil-dispersed, thixotropic, all-purpose rust preventive formulated to provide unsurpassed long-term protection against rust and oxidation. Because of its thixotropic characteristics, Rust Pro has the ability to become fluid with agitation enabling the residual film to be self-healing. - Long-term protection for ferrous and nonferrous parts up to 5 years indoors and 2-3 years outdoors. - Can be sprayed or brushed for even coating of the surfaces. - Once on the surface of the part, Rust Pro becomes semi solid reducing drips and runoff. - Superior clean-ability, it can be easily removed with and alkaline cleaner. - On parts exposed to salt spray environments. - When parts will be subjected to long term or storage or transportation. - When maximum protection is required against corrosion. Apply undiluted for maximum protection. The product can be applied by airless spray or dip. Target application film thickness is 2ml. When dipping, the tank should be agitated so that the product becomes fluid and completely coats all surfaces. ​- Airless sprayer – 450 sq. ft. per gallon. - Paint roller – 600 sq. ft. per gallon. - Brush – 650 sq. ft. per gallon.